Hemorrhage describes the escape of blood from a ruptured blood vessel. It is a life threatening condition, associated with roughly 25 percent of worldwide maternal deaths from childbirth complications. Recognizing the severity of hemorrhagic shock, researchers at the University of British Columbia (UBC) have developed an innovative mechanism to stop severe blood loss. To prevent hemorrhaging at the site of injury, the team designed self-propelled particles that travel through the bloodstream to halt bleeding in hard-to-reach places. These particles are a promising treatment for wounds that cannot be adequately treated superficially or with injections — the common procedures in use today. The team’s findings have immense implications not only for medicine, but for global health, as these self-propelled particles could be an effective treatment for bleeding in regions of the world lacking sufficient surgeons and other trained medical personnel. Photograph shows foaming after the application of self-propelled microparticles containing thrombin. Image courtesy of Science Advances. Only a couple of microns in size, the UBC particles propel themselves through the bloodstream to injury sites, bearing cargoes of blood-clotting agents called coagulants. In the study, the microparticles carried thrombin, a coagulant that initiates aggregation of platelets at the site of a wound to prevent blood loss. In addition to encouraging platelets to clump together, thrombin produces fibrin, a protein that forms a lattice to strengthen the platelet clot. While self-propelled particles could theoretically transport various types of medications within the body, Christian Kastrup — paper author and assistant professor at UBC — explained that his research team is most excited about treating bleeding, specifically. “Hemorrhage is one of the leading killers of young people worldwide, and it is particularly devastating in certain types of bleeding, such as post-partum hemorrhage,” he said. Uncontrolled blood loss, whether from internal complications or external trauma, can have severe consequences. Extreme bleeding eventually reduces blood pressure and hinders oxygen transportation to the point where a patient experiences fatigue, confusion, loss of consciousness, and even organ failure. The newly designed microparticles are expected to be most effective in situations where surgeons cannot access the blood vessel directly. In these situations, which include injuries within the sinus, uterus, and gastrointestinal tract, a piece of gauze with coagulant is unable to stop blood loss. The superficial application of coagulants is often unsuccessful in preventing bleeding from severe wounds. In areas of the world where access to blood transfusions is minimal, mortality rates due to hemorrhaging are especially high. 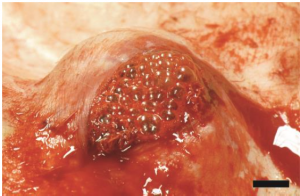 By providing new methods for delivering coagulants, this recent research aims to treat a wider variety of wounds and to increase treatment options available at locations without adequate medical care. An image of a carbonate microparticle propelling in a Petri dish. Image courtesy of Science Advances. According to Kastrup, self-propelling particles have been extensively researched in the past, but prior studies failed to identify a successful mechanism for propulsion within blood. His team was the first to test microparticle transportation upstream against blood flow. His engineered microparticles contain two substances that react with each other to produce bubbles of carbon dioxide. When the microparticles expel these bubbles, they can push themselves through a solution. Thus, when used in vivo, the microparticles can be transported against the flow of blood and deeper into a wound. Kastrup’s group showed the efficacy of coagulant-carrying self-propelled particles in animal models. The next step, not so far in the future, is to test this technique on human wounds. The percentage of mice that showed blood clotting after amputation. Image courtesy of Science Advances. The transition from the discovery phase of research to the clinical trial phase is often a challenge, but Kastrup is confident. In fact, he believes that the timeline for preclinical experiments of UBC’s self-propelled particles will be accelerated, since several components of these microparticles are already in use within clinics. For example, one ingredient of these particles is calcium carbonate, which is also found in antacid tablets. 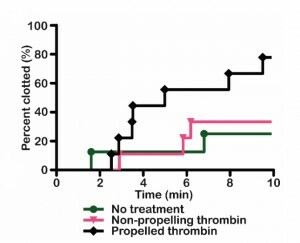 Thrombin is already used to prevent blood loss during surgery. By reimagining the method of delivery for a known therapeutic — the coagulant — these researchers present a thrilling new treatment option. Hemorrhaging is a pressing medical concern in all countries, and these self-propelled microparticles have tremendous potential to advance trauma care around the globe.